SOF News Update 20180718 – Thai SEAL honored, more CH-47s for SOAC, IS in Africa, ST and Air Force Cross, China’s SOF, Army Futures Command, CV-22 video, ISKP resilient against USSF, CJSOTF-I video on IO in Iraq, SEAL fundraiser in NH, how the AF trains SOF ground Airmen, new cdr for 8th POG, Fuerzas Comando 2018, 2017 NSS, and more. Thai SEAL Honored. The Thai Navy SEAL who died in the cave rescue of the 12 Thai soccer players and their coach has been honored by Thailand’s King. Saman Kunan, aged 37, died while placing oxygen tanks in the cave complex in preparation for the rescue. (SBS.com.au, July 14, 2018). China’s Special Forces. The Peoples Liberation Army (PLA) just completed a series of exercises for its SOF units. Read “China’s Special Forces Units Are Getting Ready for War”, National Interest, July 17, 2018. Fuerzas Comando 2018. 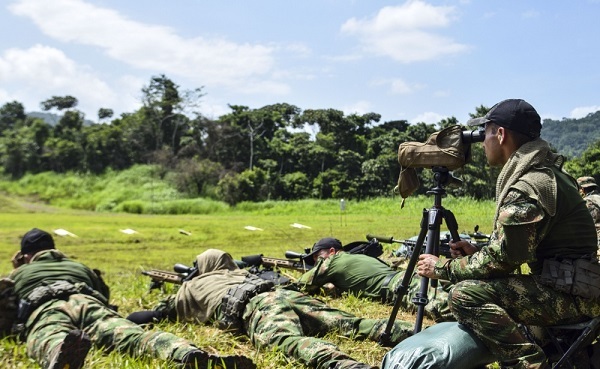 A multinational special operations competition is taking place in Panama. Over 17 countries are participating – all from the western hemisphere. Read “Special Operations Competition Kicks Off in Panama”, Department of Defense, July 17, 2018. ST Airman and Air Force Cross. Air Force Combat Controller Master Sergeant Robert Guierrez spoke to Pentagon reporters about his actions in Afghanistan for which he was awarded the Air Force Cross. (Air Force Times, July 13, 2018). New CH-47s for SOAC. The U.S. Army Special Operations Aviation Command will receive four new MH-47G Block II Chinook helicopters. (American Machinist, July 15, 2018). ISIS Resilient against USSF. The U.S. Special Forces alongside Afghan SOF have been actively pursuing the Islamic State of Khorasan Province for a couple of years. Although ISKP has been damaged it has proven resilient. (ABC News, July 15, 2018). SEALs Raise Money for NH Veterans. A New Hampshire charity has raised thousands of dollars for veterans with special needs and was assisted by U.S. Navy SEALs. Read “The real SEAL: Swim with a Mission”, The Laconia Daily Sun, July 17, 2018. SOF Pilot Awarded DFC. An AF MC-130J Commando II pilot has been awarded the Distinguished Flying Cross for his efforts to resupply Army Special Forces soldiers under heavy fire in Afghanistan. Two years ago a Special Forces team was in a tough battle (one Green Beret was killed) and were desperately in need of ammunition, water, and medical gear. The pilot made the drop on the target despite taking heavy ground fire. (Air Force Times, July 17, 2018). AF Needs more SOF Airmen. The U.S. Air Force has activated a new unit to recruit for its special operations units. The 330th Recruiting Squadron is solely dedicated to filling the AF ground-based combat jobs – battlefield airmen – who are assigned to pararescue, combat control, tactical air control party, and special operations weather teams. (Air Force Times, July 17, 2018). New Cdr for 8th POG. Fort Bragg saw the change of command for the 8th Psychological Operations Group take place. The 8th POG is one of two active duty psyop group’s. See “8th Psyops Group Welcomes New Leader”, Fayetteville Observer, July 17, 2018. Former Green Beret Running for MA 6th District. Joseph Schneider is running against Democrat incumbant U.S. Representative Seth Moulton (a former Marine). (ItemLive.com, July 16, 2018). IS in Africa. Is the Islamic State expanding its reach in Africa? According to two observers the jihadist group is gaining strength in the Sahel. Read “The fight against Islamic State is moving to Africa”, The Economist, July 14, 2018. A-29s for Mali. Four new Super Tucanos are in the works for Mali. A great counterinsurgency aircraft used by other nations – one being Afghanistan. It does appear the targeting equipment on the aircraft are somewhat lacking. Some politics between the U.S. and France have made the A-29s less lethal. Hmmm. Examining the 2017 National Security Strategy. James Torrence outlines the strengths of the NSS and provides some recommendations on how to improve it. (Small Wars Journal, July 16, 2018). Improving Force Development. David Ochmanek has published a report that indicates the DoD has failed to adapt to a deteriorating security environment. He believes there is an urgency to modernize U.S. military capabilities and has some recommendations on how we can best keep pace with the military capabilities of Russia and China. Read Improving Force Development Within the U.S. Department of Defense, RAND Corporation, July 2018. CV-22 Factoid Video, 27th SOW, July 13, 2018. A short 2-min long video provided by the 27th Special Operations Wing Public Affairs has some fast facts about the SOF Osprey. Music could be better but . . .
CJSOTF-I Video on IO. An information operations course was recently conducted in Baghdad, Iraq. Watch a 2-min video entitled CJSOTF-I Special Report: The Future of Iraqi Information Operations, CJTF-OIR, July 14, 2018. Army Officials Announce New Army Command, DoD News, July 13, 2018. Army Secretary Esper, General Milley, and others announce the creation of Army Futures Command. (34 minutes). Panel Discussion – CT Cooperation. The Center for Strategic & International Studes (CSIS) held a panel featuring Colby Goodman, Stephen Tankel, Alice Hunt Friend, and Melissa Dalton. With Partners Like These: Strategies and Tools for Counterterrorism Cooperation. (July 16, 2 hours, starts at 30 minute mark).